We have enjoyed watching you grow and expand, and we are of course not the only ones who are watching and enjoying. Now, for some of you, this can feel a bit invasive, but we want to assure you that the function of all of this watching is actually to serve many different purposes. 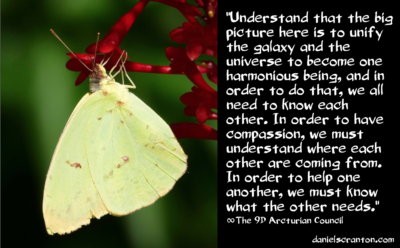 Understand that the big picture here is to unify the galaxy and the universe to become one harmonious being, and in order to do that, we all need to know each other. In order to have compassion, we must understand where each other are coming from. In order to help one another, we must know what the other needs. So as much as everyone enjoys privacy, please recognize that it is ultimately overrated and keeps this illusion of separation in the consciousness of everyone who seeks it out. You have been made aware in recent years of how much spying goes on with the Internet, and with all of the cameras that are now in place in your major cities. You also have satellites, drones, and other ways of observing one another. Now, as you know, not all of the ones watching are benevolent beings, but all of the surveillance is helping humanity come to terms with the fact that you are being observed. And most of the beings who are observing you are doing so for the aforementioned reasons. We want to unify, and we want peace and harmony. We want to help. We also recognize that humanity has a lot to teach all of us because of the harsh conditions you have been living in for so long, and everything happens by agreement. So whether you realize it or not, you have given your consent, and all of the observing is resulting in some wonderful strides forward towards that big picture goal of unifying the galaxy and the universe.